Flexor tenosynovitis is a bad infection in the finger. It usually requires surgical intervention for treatment. The current standard of diagnosis is primarily clinical, sometimes with the help of blood tests. 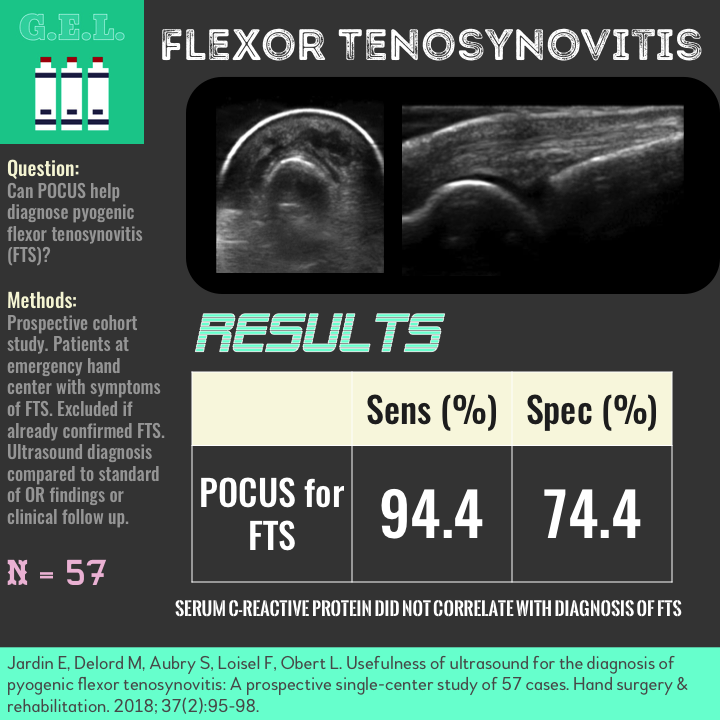 Since the disease process should produce a fluid collection around the flexor tendon sheath - the idea in this study is that perhaps ultrasound can visualize that fluid and clench the diagnosis. This would lead to ensuring the proper treatment to those who need it and potentially avoiding an unnecessary operation for those who don't. So how well does this plan work out? Should we be doing this routinely? We already know that ultrasound can be used to help with endotracheal intubation. The idea is that you can visualize the trachea and esophagus while someone is attempting to place the endotracheal tube - and see which one lights up with the air-filled balloon. Since some people are actually doing this now, it might be important to figure out the best way to perform this ultrasound exam. Where do you put the transducer? Do you add pressure? How long does this take? 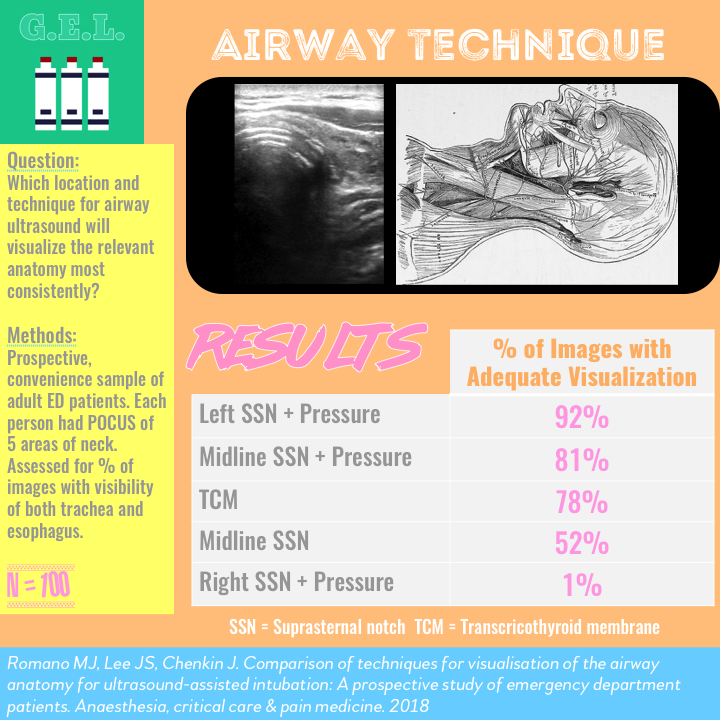 Some of these answers are obvious, but this study takes a look to figure out where you can get the most bang for your airway ultrasound buck. Too much for the masses? 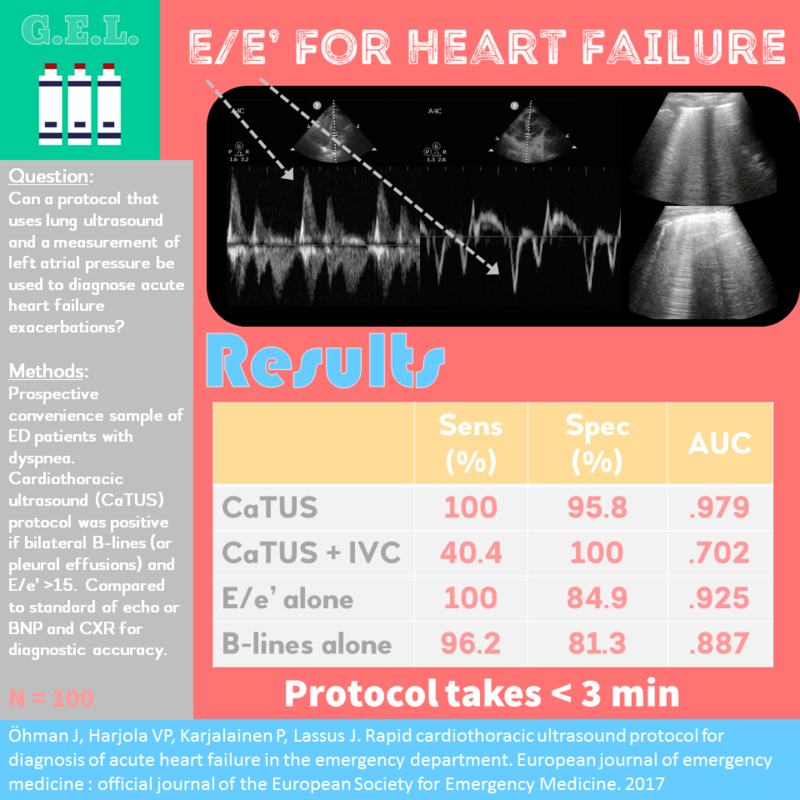 Point of care ultrasound protocols for acute heart failure are a dime a dozen these days - for good reason. Ultrasound has made this diagnosis way easier in the acute care setting. The question now is who can come up with the best protocol - something easy, accurate, and fast. These authors put their spin on the traditional heart and lungs protocol by including a measurement of the left atrial pressure. How does it hold up?